Recently in an email to a family member, I was reflecting on my thoughts and emotions surrounding the realization that Kate was most likely going to be born with Down Syndrome. I was around twenty-two weeks gestation and had been through a series of ultrasounds looking for signs of her condition. Her heart was in perfect shape and no conclusive percentage was offered. But after looking at a 3-D ultrasound image of her profile, there was no real doubt in my mind that she would have Down Syndrome. I can still remember sitting on the edge of our bed, tears streaming down my face as I prayed for God to help me. What follows is what I remember thinking that day and in the days that followed. If I was forming a baby, my baby, I would make it perfect. No defects, no problems, no diseases, no chromosomal issues. Perfectly whole. So why would God do anything less? Do I love my baby more than God does? No, I'm a sinful mother and God is God. I'm full of failing love and He is full of unfailing love. So how did I reconcile that He was making a baby that most likely was not going to be completely whole and perfect and that He is still full of unfailing love? I had to tell myself that Kate's DS was God's perfect and best plan for our family at this time. That was hard and I think that is what brought the tears at that moment. God's plans and purposes were greater than mine and I needed to stop thinking like me and think more like Him. As we head into our studies of Ancient Greece and Ancient Rome, here's a quick post to show most of the books we will be using along with The Story of the World. I'll post more details about our study as we progress including the additional books I'm still tracking down. It was written by the author of our Belgic Confession, Guido de Brès. It was written in April, 1567. He was in prison and he knew that he was going to die for what he had confessed. He was hung on May 31, 1567. I have kept in the format that Amy posted it so it can be read easily and often in the future. Here is the original link to the article in which it was cited. I have been working on updating the What We Do For Homeschool section in my left sidebar to make the information as complete and current as possible. I still have some work to do but in case you are in interested in any changes I have made, please click around on the subject links. I alluded to a incomplete Christmas project here and since it has since been delivered and unwrapped, I can now show you the whole project. Please let me say at the outset, I had an idea here but no definite pattern or plan. In other more plain words, I just made it up as we went along. So I would never consider this post a tutorial, I'm thinking it's more like a show-and-tell post. The cardinal came out better than I hoped although it would have nicer to make it look like it was actually resting on the tree and not hovering over it like a hen on her nest. I also tried to keep it a generic scene so that it could be enjoyed after the traditional Christmas decorations are put away. So while we were sewing, I was toying with stuffing the burlap with something in the spice family. However I was concerned that anything I chose might eventually start coming out of the large weave of the burlap. So enter, the spice sachet! I found a scrap of muslin, folded it over and started sewing it up like a pillowcase. Then we stuck in some cinnamon sticks and a small handful of cloves. Sewing up the spices in their own sack was an easy solution and their scent was very fragrant even through the layers of fabric. We then stuffed the sachet inside and out of sight, applied fray check to keep the burlap weave from fraying and then Seth began to sew straight stitches around the folded fabric. He had to be careful not to go too close to the edge since the burlap is such a loose weave, it would be easy to lose some of the threads. But with only a few mishaps, he carefully sewed all three open edges and secured the spices inside. And here is the completed ornament ready to be wrapped and shipped off to the grandparents. Actually, what really happened was that Seth decided he wanted me to have the ornament, so off he snuck with it, gift wrapped it and made a tag that said, "To Mommy, From Seth". Within a day, I grew concerned when I could not find it on the pile of stuff that overtook our school table. Finally, hoping against hope that it had not found its way accidently to the garbage, I asked Seth if he had seen it. One sheepish look and he confessed that he had gift wrapped it for me and it was up tucked away in his room. While I appreciated his sweet gesture, I reminded him that we were sending it as a homemade present and we could always make another one for us. I felt bad opening up his "gift" but I had no idea he would do that considering we had discussed many times who we were making it for. So cute! So I guess we'll be making more of these little spicy fir trees as we continue to practice our sewing stitches, now that we know what we're doing, lol. In my efforts to clear up my face, I have switched to gluten-free bread and pasta for myself and so far I have been quite pleased with the results. Besides not eating whole wheat bread and pasta, I have simply cut back on how much other wheat-based products I indulge in like crackers, pretzels and cookie-type stuff. I have also ventured into the world of rice crisps, which is astounding given how much I hated them previous to this diet change. But I have found a few brands which have a good flavor and seasoning and make them quite palatable and knowing they are easy on my body makes them actually enjoyable. Life is full of ironic surprises like that. So while my husband makes faces over these new food items hanging out in the pantry, I just smile and remind him, he's not the one who has to eat the stuff, dear! With Christmas behind us and a long winter ahead of us, Raymond Brigg's wordless story of a boy and his snowman is just the cure to keep the winter blues away. 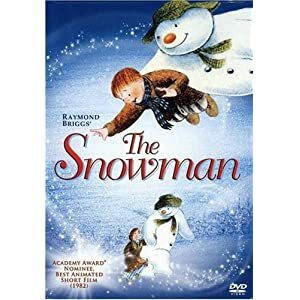 Set to beautiful music, this movie with no dialogue illustrates the delightful adventures of a having a snowman for a friend. A truly magical movie, I love it! On another day, here we find the two mischief-makers minding their own business when a box of tissues was conveniently left where Laura could reach it while Momma folded laundry just a few steps away in her room. Yes, that is a lot of tissues packed into one small box, Laura thinks as she counts them all out, "One for you, one for me, two for you, two for me...". Here is a photo essay of evidence that I tried very hard this year to photograph our three delightfully cooperative children for a picturesque photo to send to all our friends and family near and far for this holiday season. Please note the past tense. This plan failed miserably and I am now appealing for your pity as we struggle to emerge from the plague that hit our house the Eve before Christmas Eve. There will be no Christmas card mailing. There will be no sweet family photo showing our five faces smiling and happy sitting somewhere seasonally appropriate. This is it. Enjoy the confusion and mayhem, it was real. Note the tissue in her hand, it was the only thing holding her together at that moment. Tissue is gone and in a moment so is the temporary good humor. The only one left standing, uh, sitting. All dressed up at church, on their best behavior, of course. And look this way, children! Another fail for Momma as Kate attempts to encourage her pew mate. There's always next year!